Medianism Economics that regards people more democratically. Basically, there are two outliers, the US and Qatar, and they are so different from all other rich nations, that they should both probably be excluded. 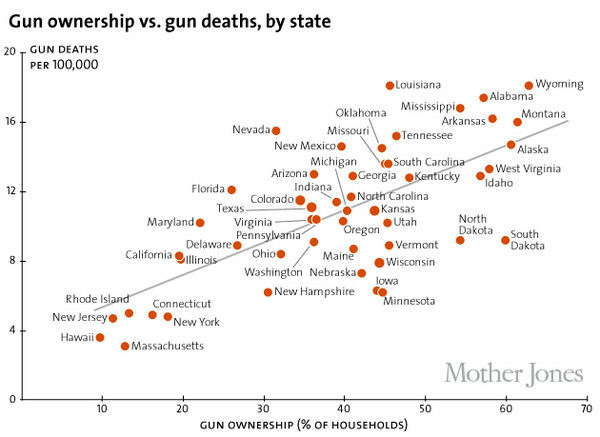 When you do that, again there is almost zero correlation between guns and homicides. That doesn’t mean that guns don’t contribute to the high homicide rate in the US, but it just isn’t a simple matter. Lots of other factors are also important such as environmental lead, criminal justice, inequality, etc. Below is another graph using data from Wikipedia’s entry about firearm-related deaths which looks more reliable than NationMaster because Wikipedia cites where all their data comes from, and it is more up to date. It tells a very similar story. That is using the Nationmaster & World Bank data again. Each gun kills over 2,000 times more people in Tunisia than in Switzerland. Here is a close up of the left tail of the above graph to show the nations that have low levels of homicides per 1,000 guns like in the USA. Only about 1 in 20,000 guns is used to kill people in America on average. That is just a few bad apples. ‹ US median income finally rises above record set in 1999. Yea! Thanks George, I updated the text and included your link at the bottom of the original post. I agree that the research overwhelmingly shows that gun control generally saves lives, but after living in Latin America, I can’t say that the homicides that gun control can prevent are anywhere near the biggest public health problem that any country faces and although the gun fanatics are simply wrong to think that greater gun access prevents violence, both sides are actually irrational in overly focusing on their excessive fear of violence because lots of other issues are more important than guns in determining public health or even for determining levels of violence, so we should all take a deep breath and try to focus more on issues where we can more easily find common ground to improve society. Let gun fanatics cling to their irrational fears and instead of trying to get them to be more rational, lets work with them on issues that we can achieve more on that don’t trigger their irrational fears. ...in chronological order from newest to oldest. Median individual income is still fairly stagnant, particularly for men. PBM: The healthcare bureaucrats that you have probably never heard of. Why doesn’t Amazon police their own product reviews? Market failures in everything. Hyperlinks are the citation format of the 20th century, but academia hasn't quite figured out how to use them. Deflation is worse than inflation. Inflation can be good. “Table 3” for the Economist Magazine article entitled: “Why trade is good for you”. A Timeline of efforts to go beyond GDP. M1. What is Median Expected Lifetime Income (MELI)? M2. Why is MELI Better Than GDP? M3. Why is MELI Better Than The United Nations’ Human Development Index (HDI)? M4. If median income is better than GDP and the HDR, why doesn’t anyone use it? M5. Why doesn’t anyone care about existing measures of median income? M6. Why hasn’t anyone adjusted median income statistics to make them more useful? M7. What Are Ways In Which MELI Is Easier To Measure Than GDP? M8 Does GDP have any advantages over MELI? M2.1: GDP measurement would improve if it focused on production and let MELI focus on well-being.